Demand for skilled foreign nationals remains high across Asia, but when conducting business as a foreign national in a foreign country, it is important to be aware of the regulations governing foreign executives’ stay abroad. Employers with a physical presence in these markets must also understand the proper procedures for sponsoring a foreign worker. The necessary documents required for a foreign national working in Asia vary country to country, but typically include a specific work visa, a work permit, and/or a residence permit. However, short-term visits for purposes of due diligence, quality control, or trade fairs, for example, may be covered through the issuance of business visas. In this edition of Asia Briefing Magazine, we outline the specific documents required for foreign nationals working in China, India, Indonesia, Malaysia, Philippines, Singapore, Thailand and Vietnam, as well as highlight the relevant application processes in each of these countries. Attention is also given to the role of the sponsoring company and the regulations they must adhere to. Once the appropriate visa and work permit has been identified, it is important to prepare the appropriate documents needed for a successful application. Accompanying each country’s visa and permit structure, you will find a complete list of the essential documents required when filing for permission to work abroad. As the international business landscape continues to evolve, policies governing foreign nationals working abroad have also begun to change to reflect these new paradigms - China’s new visa policies are a perfect case and point. 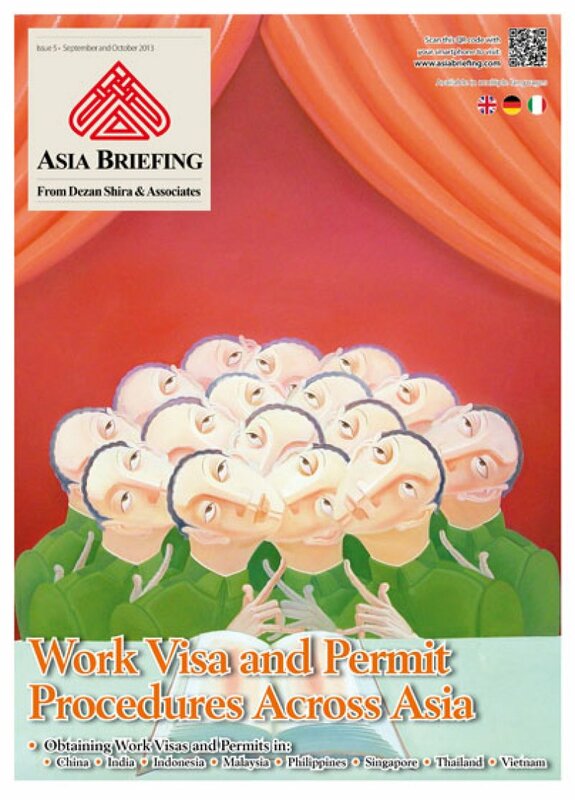 We hope this issue of Asia Briefing Magazine helps our readers successfully navigate through the often complex subject of employment abroad, while also proving to be a useful resource for companies looking to stay in compliance with their host country’s relevant labor regulations.